This package contains the features related to the graphic capabilities of chemlab. The two following functions are a convenient way to quickly display and animate a System in chemlab. Display the system sys with the default viewer. Display the the system sys and instrument the trajectory viewer with frames information. The time corresponding to each frame. This is used only for feedback reasons. Atomic coordinates at each frame. This class can be used to build your own visualization routines by attaching renderers and uis to it. Add a renderer to the current scene. Arguments used by the renderer constructor, except for the widget argument. The istantiated renderer. You should keep the return value to be able to update the renderer at run-time. Add an UI element for the current scene. The approach is the same as renderers. Schedule a function to be called repeated time. This method can be used to perform animations. remember to call QtViewer.widget.repaint() each once you want to update the display. A function that takes no arguments that will be called at intervals. Time in milliseconds between calls of the callback function. It provides interface elements to play/pause and set the speed of the animation. To set up a QtTrajectoryViewer you have to add renderers to the scene, set the number of frames present in the animation by calling ;py:meth: ~chemlab.graphics.QtTrajectoryViewer.set_ticks and define an update function. Use with caution, the API for this element is not fully stabilized and may be subject to change. The behaviour of this function is the same as chemlab.graphics.QtViewer.add_renderer(). Update the time indicator in the interface. Set the number of frames to animate. Set the function to be called when it’s time to display a frame. 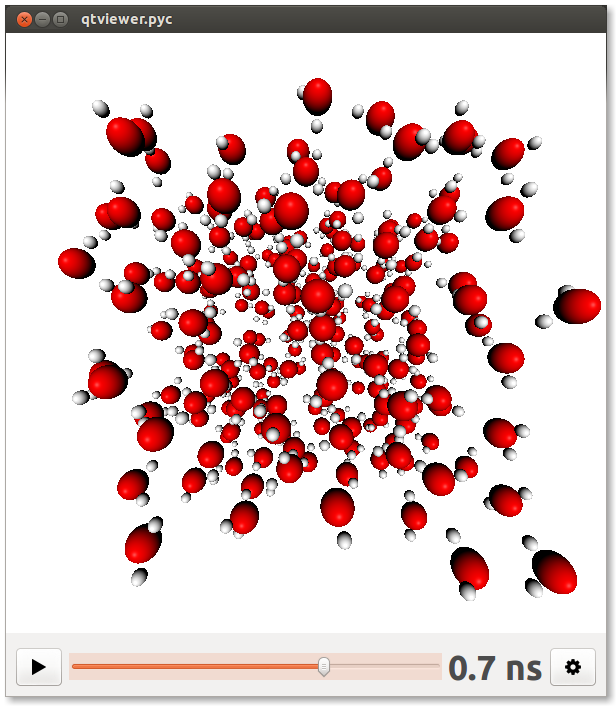 This is the molecular viewer widget used by chemlab. Extensible and modular OpenGL widget developed using the Qt (PySide) Framework. This widget can be used in other PySide programs. The widget by itself doesn’t draw anything, it delegates the writing task to external components called ‘renderers’ that expose the interface found in AbstractRenderer. Renderers are responsible for drawing objects in space and have access to their parent widget. At this point there is only one ui element available. PySide provides a lot of UI elements so there’s the possibility that UI elements will be converted into renderers. It is a list containing the active renderers. QChemlabWidget will call their draw method when appropriate. The camera encapsulates our viewpoint on the world. That is where is our position and our orientation. You should use on the camera to rotate, move, or zoom the scene. The light direction in camera space. Assume you are in the space looking at a certain point, your position is the origin. now imagine you have a lamp in your hand. light_dir is the direction this lamp is pointing. And if you move, jump, or rotate, the lamp will move with you. With the current lighting mode there isn’t a “light position”. The light is assumed to be infinitely distant and light rays are all parallel to the light direction. A 4-element (r, g, b, a) tuple that specity the background color. Values for r,g,b,a are in the range [0, 255]. You can use the colors contained in chemlab.graphics.colors. Our viewpoint on the 3D world. The Camera class can be used to access and modify from which point we’re seeing the scene. It also handle the projection matrix (the matrix we apply to project 3d points onto our 2d screen). The position of the camera. You can modify this attribute to move the camera in various directions using the absoule x, y and z coordinates. Those three vectors represent the camera orientation. The a vector points to our right, the b points upwards and c in front of us. By default the camera points in the negative z-axis direction. The point we will orbit around by using Camera.orbit_x() and Camera.orbit_y(). Camera matrix, it contains the rotations and translations needed to transform the world according to the camera position. It is generated from the a,``b``,``c`` vectors. Projection matrix, generated from the projection parameters. Scale factor used to generate the projection matrix. Aspect ratio for the projection matrix, this should be adapted when the application window is resized. Convenience function to implement the mouse rotation by giving two displacements in the x and y directions. Convenience function to implement a zoom function. This is achieved by moving Camera.position in the direction of the Camera.c vector. Same as orbit_y() but the axis of rotation is the Camera.b vector. We rotate around the point like if we sit on the side of a salad spinner. Orbit around the point Camera.pivot by the angle angle expressed in radians. The axis of rotation is the camera “right” vector, Camera.a. In practice, we move around a point like if we were on a Ferris wheel. Receive x and y as screen coordinates and returns a point in world coordinates. This function comes in handy each time we have to convert a 2d mouse click to a 3d point in our space. Horizontal coordinate, -1.0 is leftmost, 1.0 is rightmost. Vertical coordinate, -1.0 is down, 1.0 is up. Depth, -1.0 is the near plane, that is exactly behind our screen, 1.0 is the far clipping plane. The point in 3d coordinates (world coordinates). © Copyright 2012, Gabriele Lanaro. Created using Sphinx 1.1.3.